Roasted Beet Pasta with Dill and Lemon | Naturally.Roasted Beet Pasta with Dill and Lemon | Naturally. Preheat oven to 375˚. In a roasting pan, toss beets with olive oil and sea salt. Cover the pan with foil and place in the oven. Roast for around one hour- until beets are tender. Remove from the oven and let cool enough to handle beets. Peel the beets and cut into chunks. While beets are cooling, cook pasta according to directions. Drain and place in a bowl. In a blender, combine beets with heavy cream, lemon juice, 1/4 cup pasta water, dill, and salt. Puree until mostly smooth. Taste and add more salt if desired. 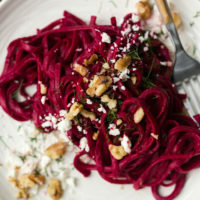 Add the beet puree to the pasta and toss until the pasta is well coated, adding more pasta water if desired to thin out the puree. Top the pasta with crushed toasted walnuts, feta, and dill if desired. + To speed up the process for dinner, roast the beets ahead of time. + I have a high-powered blender which makes for a creamy puree. If using a food processor or regular blender, the puree may have a bit more beet texture.